I have a section of my yard that has never been landscaped, and is full of native shrubs and flowers. The other day I noticed a shrub with berries that I had not noted before (though by its size, it has been there for many years). With the help of Brett T., it has been identified as Shepherdia canadensis or Canadian buffaloberry, which is also known as soapberry. “The bitter berries are not eaten directly but rather processed as sxusem (‘sxushem’) or ‘Indian ice-cream’. Branches bearing fruit are hit with a stick and only the very ripe fruits that fall off are collected. A clean mat or tarpaulin is placed below the bush for collection. The berries are later placed into a great bowl that is absolutely free of oil or fat and are mixed with some sweet fruit such as raspberries. The mixture of berries is crushed and vigorously beaten in the manner of whipping cream in order to raise the typical foam of the sxusem confection. There are both male and female shrubs; the male does not produce fruit. They can grow to 5 feet tall or so on a woody stem. The deciduous leaves are oval, dark to medium green in color, and arranged in simple, opposite manner (not alternating). 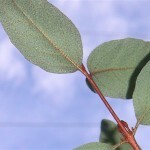 The underside of the leaves is a lighter grey-green from tiny silvery hairs, with rusty colored spots or scales. It’s yellow flowers are inconspicuous and not notable. 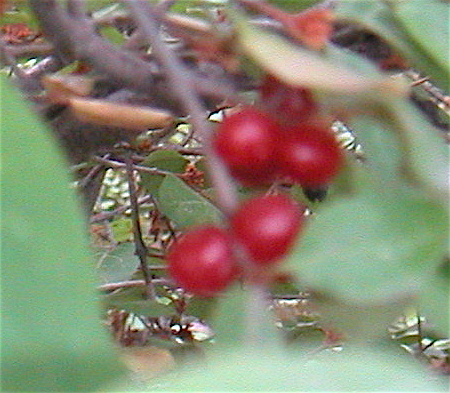 The ripe berries are orange to red, slightly translucent, and about 1/4 inch in diameter. If you crush them, they will make a soapy foam. They are not sweet and in fact are bitter, but many animals eat them, including deer and bear. 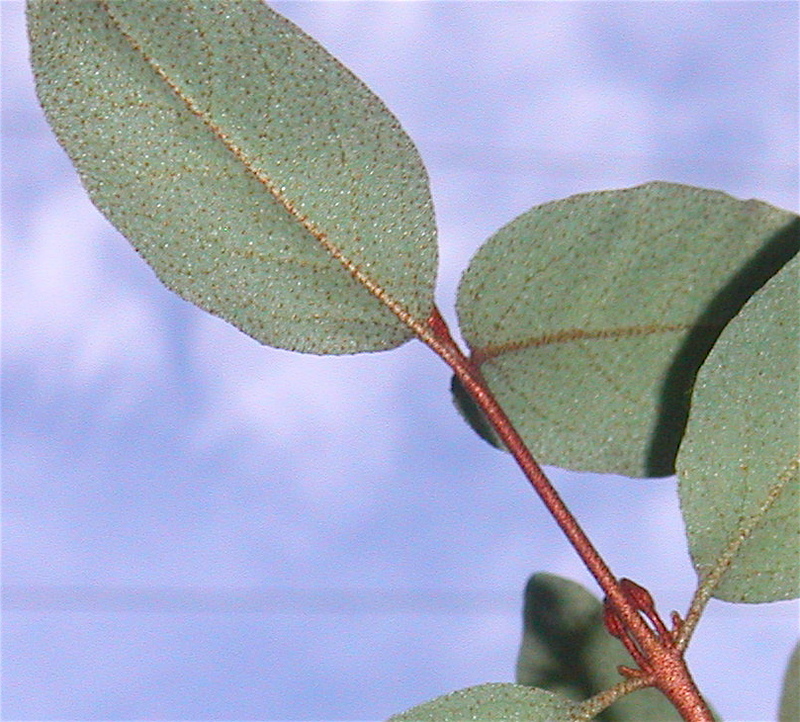 Buffaloberry is drought tolerant, and has nitrogen-fixing ability. It can be propagated by seed or cuttings. See the GOERT website for more information (3). Photo, right (used by Rural Montana Maggzine, October 2010 issue) by Steve Akre; see outwestphoto.net. 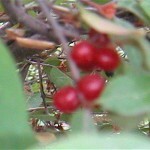 Note that buffaloberry is another name for soapberry. “If you learn to identify only one plant in the Canadian Rockies, make it this one. 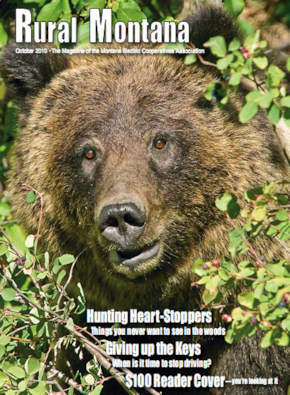 The new millennium brought with it a high incidence of bear encounters throughout the eastern slopes, all because of a bumper crop of buffaloberry. Once the berries ripen, this becomes the most important plant for bears within the northern Rockies. 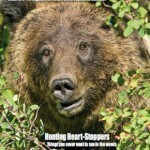 Any trail with an abundance of buffaloberries will also have bears. This entry was posted on Saturday, August 14th, 2010 at 9:24 am and is filed under Ecology, Food-Nutrition-Health. You can follow any responses to this entry through the RSS 2.0 feed. Both comments and pings are currently closed.